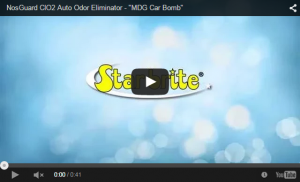 Star brite NosGUARDSG Auto Odor Eliminator is a do-it-yourself odor control system. The EPA-registered ClO2 breakthrough technology controls odor-causing bacteria, mold & mildew, and chemical odors at their source—eliminating odors with science. 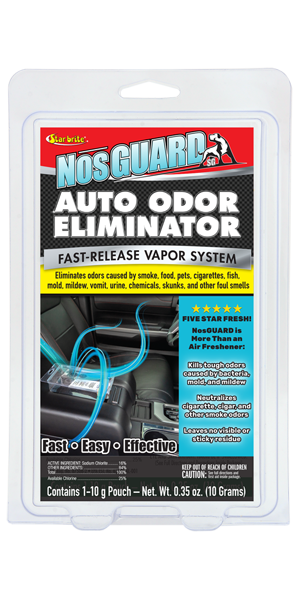 NosGUARDSG Auto Odor Eliminator deodorizes interiors from mold, mildew, cigarettes, cigars, pets, alcohol, urine, vomit, bodily fluids, bait, rotten food, and more. NosGUARDSG Auto Odor Eliminator is not to be used while people or pets are present inside the vehicle. Air out the vehicle after treatment. Not for sale in Canada. It is a violation of Federal Law to use this product in a manner inconsistent with its labeling. Read the entire label and use strictly in accordance with precautionary statements and use. NosGUARDSG removes foul odors caused by cigar/cigarette smoke, spoiled food, pet odor, chemical odors, and controls mold, mildew, and odor-causing bacteria. One unit will treat most cars and SUVs. If you need to treat a larger area, use 2 pouches placed equally apart at either end of the area. TO TREAT AUTOMOBILES (CARS, TRUCKS, RVs, TRAILERS): Remove contents from the plastic container. Open the silver foil packet and remove the white pouch. DO NOT OPEN WHITE POUCH. Saturate the sponge with water. Slide the end of the pouch into the slit of the sponge and place it back into the plastic container. Snap the container securely closed and place the unit near the center of the car, on a stable, level surface—such as an armrest or on any other central location—with holes facing up. Do not hang the container. Open glove box or any compartments that require treatment. People and pets must not be in the area undergoing treatment while the system is activated. Use the printed sign included with the package during treatment. Allow at least 4 to 6 hours for the system to work. Ventilate for one (1) hour before re-entry. Repeat treatment if odors reappear. Do not contaminate water, food or feed by storage or disposal. STORAGE: Store this product in the original unopened packaging until ready for use. Store in a cool, dry, well-ventilated area away from heat or open flame. Store in an area that is inaccessible to children. Read the entire label for pesticide handling and disposal. DISPOSAL: Discard empty packaging pouch and spent NosGUARD SG pouch in an outdoor refuse container.